The Capet String Quartet was formed in 1893 by Lucien Capet (1878-1928), and it gained a reputation for being one of the finest French ensembles of its time. Capet had been a pupil of Jean-Pierre Maurin at the Paris Conservatoire, had done some solo work and held the position of concertmaster of l'Orchestre des Concerts Lamoureux between 1896 and 1899. He was also well regarded as a pedagogue and became a professor at the Paris Conservatoire. The personnel of the Capet Quartet, with the exception of Lucien Capet himself who acted as leader, underwent several changes over the years. The line-up on these recordings isn't documented by Opus Kura. It could well be Maurice Hewitt (violin II), Henri Benoît (viola) and Camille Delobelle (cello). It focused its energies mainly on Beethoven, but did venture occasionally into more modern repertoire. The three recordings here all date from 1928, the year Capet died, so they must be some of their final recorded documents. Anyone coming to these recordings today will soon discover how performance style has changed in the intervening years. The sound is certainly leaner, less-weightier than today. Another striking feature is the use of portamento, which at the time were very much the fashion. Having said that, I was struck by the pristine intonation of the ensemble. I had read that their tone was almost vibrato-less. This is certainly not the case here, where vibrato is utilized, albeit sparingly. Care and preparation was obviously of paramount importance to the players, and their meticulous matching of phrasing is something to be admired. 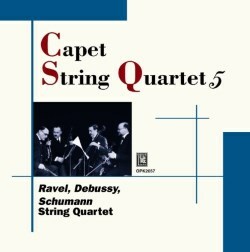 The Capet Quartet were near contemporaries of Debussy and Ravel, and show a great affinity for their two string quartets. Fervent lyricism, Gallic charm and rhythmic feel are all compelling factors. They’re certainly highly sensitive to the infinite subtleties and nuances within the music. I feel that they’re more at home here than in the Schumann Quartet, which doesn’t seem to capture their imagination quite so strongly. Nevertheless, it’s a rewarding addition. On the evidence, Y. Yasuhara has been able to access good quality source material for the transfers. French Columbias have been used for the Ravel, whilst Japanese Columbias were utilized for the Debussy and Schumann. Notes are in Japanese and English. The three quartets were also issued by Biddulph in 1996 (LAB133/4) (nla), together with some Schubert and Franck. I compared the two labels. Surprisingly, I could hear no difference between the Opus Kura and Biddulph transfers in the Ravel. A head-to-head comparison of the Debussy and Schumann, however, revealed that the Opus Kura transfers have more brightness and immediacy and are thus marginally better.